The changing of the seasons, the short gap before the next season takes over, is a great gift. It’s a time that tends to fill me with great excitement. Autumn’s waiting in the wings, yet summer isn’t ready to say goodbye. There’s no need to rush, I can indulge in Vorfreude – the German word for the happiness and excitement that we feel before a special event. The idea of coziness and comfort food, long walks in the forest and snuggly sofa time is already more than appealing. I replace my flowery dresses with a pair of jeans and a cardigan and spend just as much time outside as I did in the past few months. The sun is lower and wraps the world around me in a gorgeous golden glow, everything looks softer and warmer. My appetite shifts from lighter treats to the richer pleasures of the kitchen, and my mood is full of joy and curiosity for everything that the next couple months will bring into my life. Cooking plums with spices is a celebration of late summer, but with a subtle nod towards the festive season. 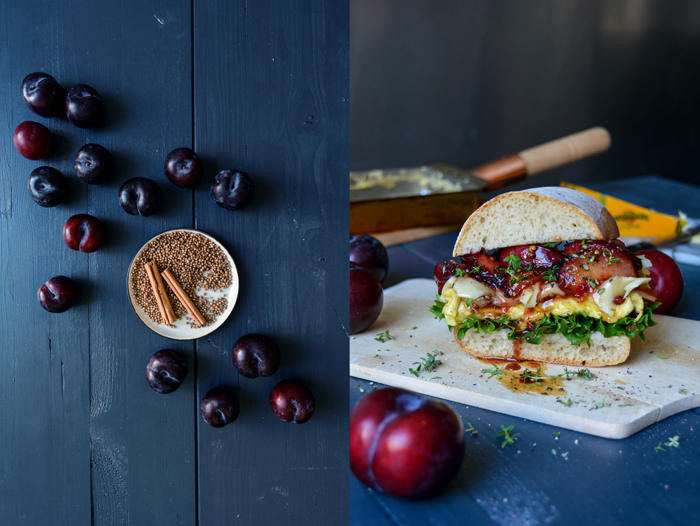 I had this aromatic duo in mind when Leerdammer asked me to create a new sandwich, a sandwich that fits my current mood. The fruit caramelized in sugar, cinnamon, and coriander seeds, sits on top of a rich cheese omelette. 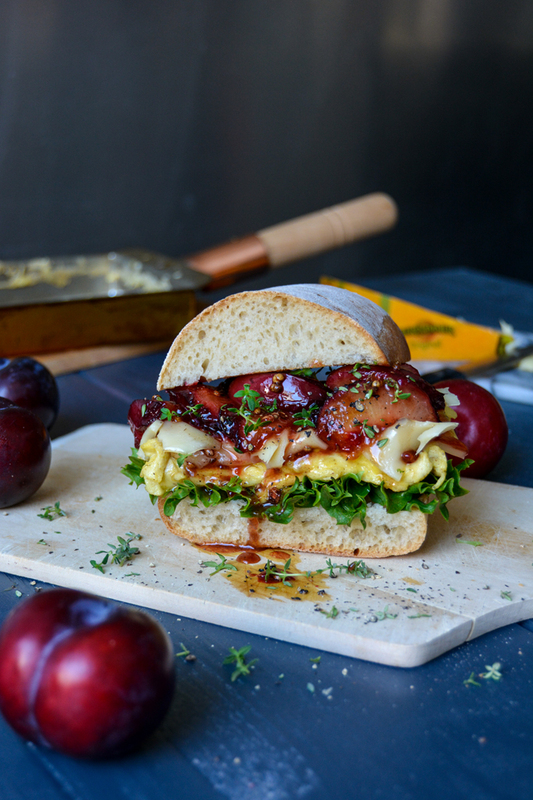 This whole juicy joy is layered in a soft ciabatta bread, sprinkled with a bit of fresh thyme. Just one bite and I’m ready to celebrate the season. 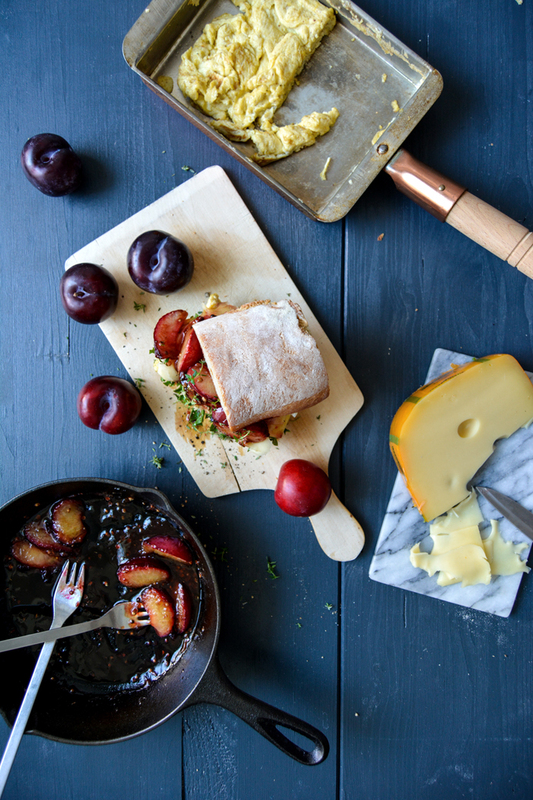 I love to indulge in the produce that every month of the year offers, especially when there’s fresh bread on the table: Be it in my Cheese, Bacon, and Egg Sandwich with Garden Vegetables, a summery light creation in June, or the pleasures of zucchini cheese fritters and strawberries piled between two slices of bread. Maybe I should come up with a sandwich calendar one day. I usually spend late September and October experimenting with roots and winter squash, with grapes, plums, and apples. I try out new meat dishes and enjoy my trusted classics. But this year, I’ll ‘lose’ a month in the kitchen. 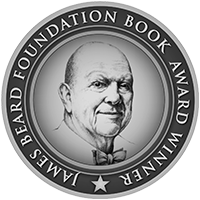 I’ll be traveling through Europe and the US pretty much all of October to launch my book and to finally present my recipes, printed on paper, physically and not just in the digital spheres of the world. As much as I know that I’ll miss my kitchen, I can’t say that this circumstance fills me with sadness. I’m nervous, excited, even a bit hysterical at times, but I can’t wait to finally open the pages of the Eat In My kitchen book and show it to all the people who I’m going to meet soon. To make up for the kitchen break ahead of me, I spent the past few weeks cooking and baking with all the ingredients that I’ll miss out on. 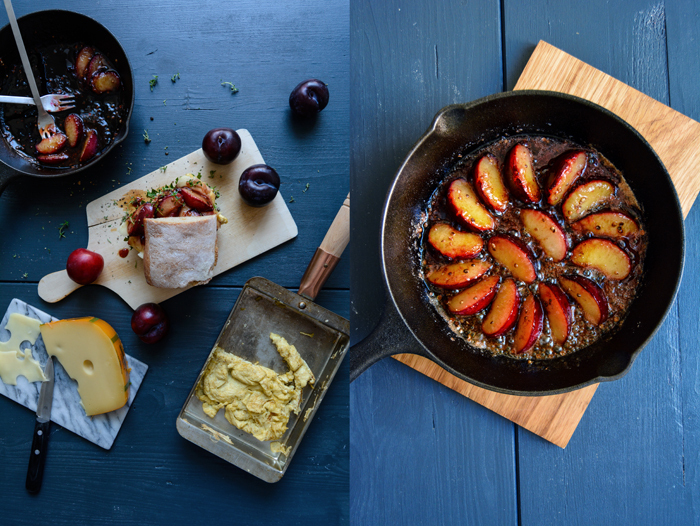 Plums are at the top of my list – for sweet and savoury dishes. If I had to choose one flavour to describe this time of the year, it would be plums. I love their sour fruitiness, especially cooked, in combination with aromatic spices. Add them to a bowl of vanilla ice cream and whipped cream and you can still taste summer, turn them into a fragrant chutney and stir them into the thick sauce of a venison stew in a couple months and you’re ready for winter. Dumplings, jam, cakes, or sandwiches, there’s no recipe that this fruit can’t deal with. 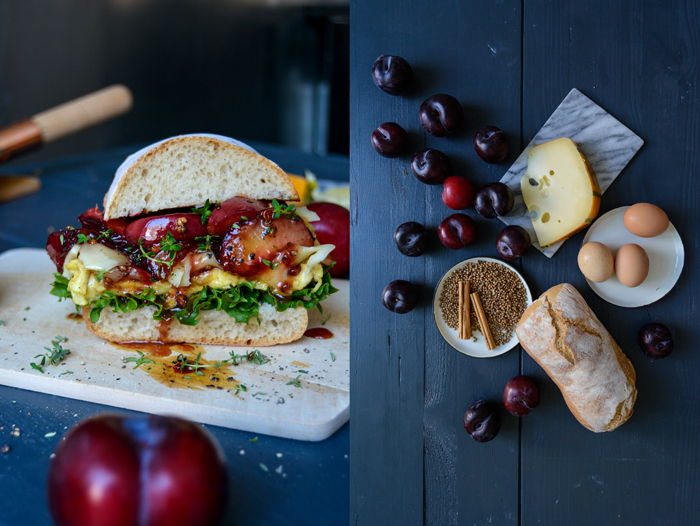 The preparation of a little sandwich masterpiece is usually not particularly time-consuming, but the result can easily be unforgettable. 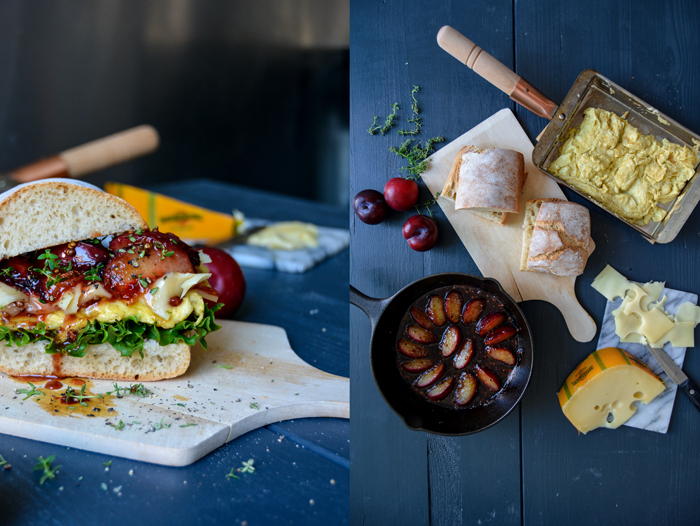 Leerdammer came up with a website where you can choose a sandwich that fits your own or a friend’s mood and send it as a greeting card to your loved ones. You might not share your sandwich, but you can at least share the good feeling that it creates. This post has been sponsored by Leerdammer. 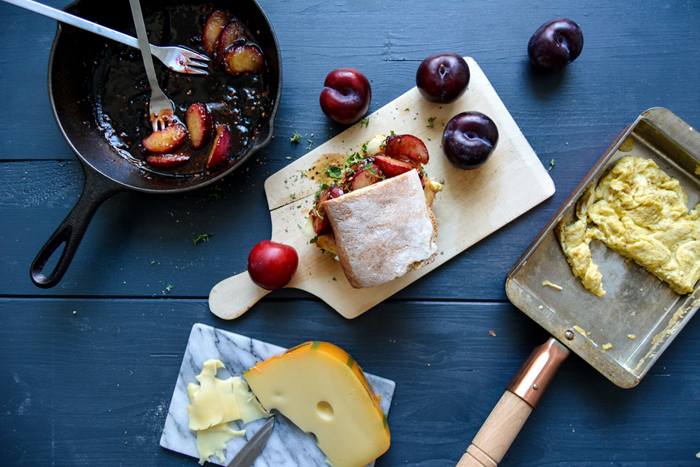 For the caramelized plums, in a medium, heavy pan, heat the sugar, butter, and spices over medium high heat, stir, and add the plums as soon as the butter is golden and sizzling. Cook the plums for about 2-3 minutes on each side or until golden and soft. Turn them gently one by one, and mind that they keep their shape. Take the pan off the heat. For the omelette, whisk the eggs and heavy cream and season with nutmeg, salt, and ground pepper. In a small, heavy or non-stick pan, heat the butter over medium-high heat. Pour the egg mixture into the pan, scramble very lightly and fold onto itself. When the bottom side starts to become golden flip the omelette around. Cook it shortly from the other side for about a minute or until the omelette is just set. Take the pan off the heat and cut the omelette into large chunks. Arrange the lettuce on top of the two bottoms of the buns. 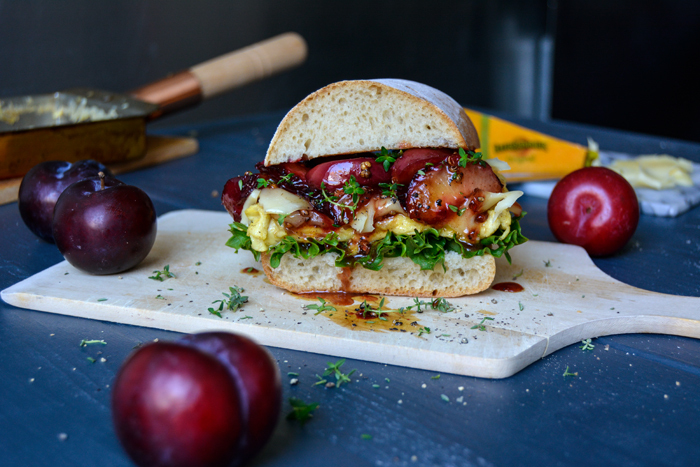 Divide the warm omelette between the buns, spread the cheese on top, then finish it off with the warm caramelized plums. Pour the buttery juices from the pan used for the plums over the fruit and sprinkle with thyme and a little crushed black pepper. Close the bun, squeeze a little – gently! – and enjoy! 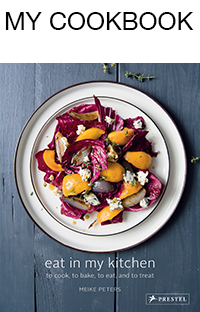 This looks so amazing that I cannot wait to try this recipe! Discovered your blog when ordering your book for my library. Will be sure to display it when it comes in. This is one of the most unique sandwiches I’ve ever seen! Taste buds would be doing a happy dance. Thanks for creating! 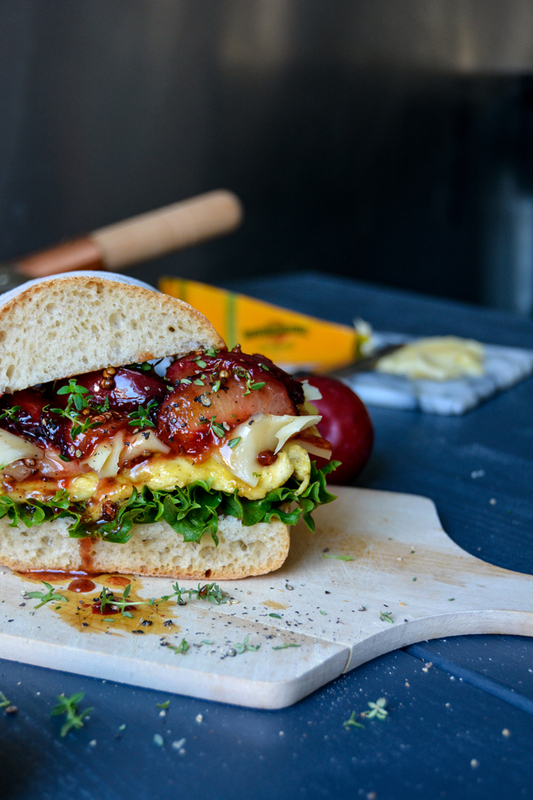 This sandwich is so unique and beautiful! Love it!